Safety Not Guaranteed is a potent and quirky picture; a film with such a lasting charm that to explain it to someone who hasn't seen it is a definite challenge. A challenge I'm willing to accept. Being that many of the film's high-points are heavily nuanced, imagine trying to describe this film like one would describe the beautiful engravings of a rare coin over the phone to someone whose knowledge of coins to begin with is very slim. The film is lead by Aubrey Plaza, but a majority of it is stolen by Mark Duplass in a difficult, fearless role. Plaza plays Darius, a directionless magazine intern for a Seattle magazine, who is given a job, along with two others, to investigate a man who put a strange ad in the classifieds section asking people to contact him if they were interested in traveling through time. The ad reads something like this: "WANTED: Somebody to go back in time with me. This is not a joke. You'll get paid after we get back. Must bring your own weapons. I have only done this once before. 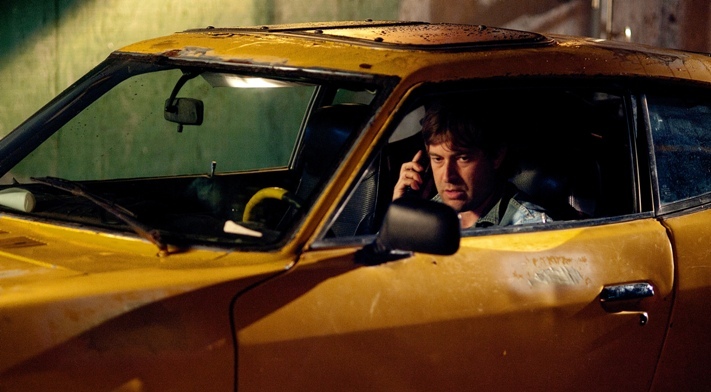 Safety not guaranteed." The two others Darius goes with are smartass Jeff (Jake M. Johnson) and awkward Arnau (Karan Soni), providing effective comic relief to the story. The three of them, not totally excited about working together, slog through this assignment by first tracking down the man, named Kenneth Calloway, to befriend him and make him believe that they will be traveling back in time with him. When Jeff winds up upsetting Kenneth, played by Duplass, Darius assumes the role of approaching the thirty-year-old, who happens to be stocking shelves at a local grocery store. Instantaneously, Kenneth finds something about her, whether it be her stunning bluntness, her unique behavior, or just her impeccable beauty, he finds something and gives her about as much of his trust as he can give to a person he just met. For the remainder of the film, we watch as these two quirky, yet vulnerable human beings (not characters) build up a stable relationship, as Kenneth trains Darius for the event of time traveling. While Kenneth painstakingly puts Darius through endurance tests, Jeff decides to look up a formal flame, who is not chubbier yet still packs a wholesome wallop, while at the same time, harasses poor Arnau, a young college student who is a virgin, taking the job of a journalist because diversity looks good in college. Even in only eighty-one minutes, writer Derek Connolly manages to gives every characters his or her own little dimensions to build off of, never limiting everyone's story in the process. But it's the performances that remain nuanced in this sea of eccentricities. Aubrey Plaza has a wonderful Emily Blunt-like screen persona, playing the straight-shooting girl, equal parts sassy and lovable, while Duplass gives arguably the best role of his short career (which is beginning to pick up in the year 2012, with already two films he co-directed and five films he has starred in). He embodies the awkward stiffness, the bottled energy, the reclusive strangeness, and the plethora of fragile instincts of Kenneth without hesitation. This is a character who is either deeply disturbed or quietly brilliant, and the film is smart enough to fuel arguments for both propositions. Safety Not Guaranteed is a winner in terms of story and performances, but a grand-slam in terms of its modestly nuanced style and its bleeding gums characters, who give us truly compelling substance with their checkered life stories. It also gives us enough information about time travel to effectively label it, among many things, a film about time travel, yet I'm sure many who enjoy those kinds of films wouldn't be too fond of this, mainly because it explores the idea with stunning seriousness and logic rather than contrivance and silliness. Yet another thing it nuances in with its kinetic whimsy and incandescent charm.